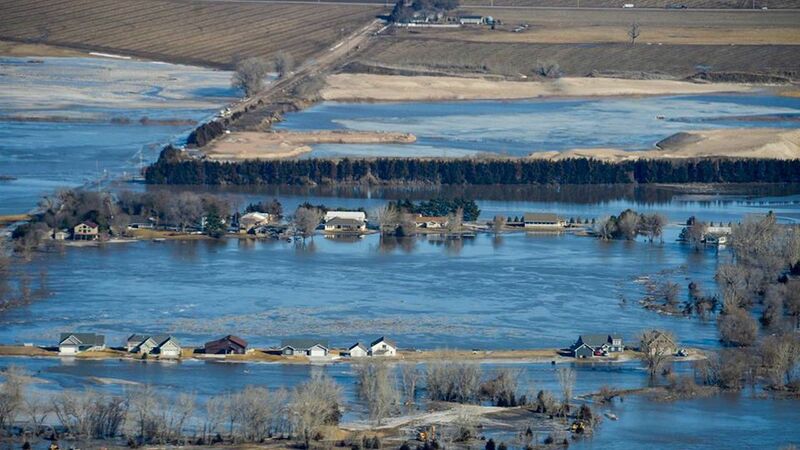 Melting snow and heavy rain from the "Bomb Cyclone" in the Midwest has caused historic flooding from the Platte and Missouri rivers. Why it matters: Nebraska Gov. Pete Ricketts said it's the worst flooding the state has experienced in 50 years, with at least two flood-related fatalities this week. Dams have failed, levees breached and other infrastructure stripped away as raging floodwaters and chunks of ice move downstream. The details: The floods have resulted from a series of events including an extremely cold winter that allowed a thick snowpack to pile up. Then the intense storm brought a sudden pulse of heavy rainfall and mild temperatures. The rain fell on impermeable, frozen ground, causing huge amounts of runoff into area rivers and streams that were choked with thick blocks of ice. Snowmelt seen from satellite on March 11 (left) and March 16 (right), during the period of the "Bomb Cyclone." Images: ESA Sentinel 2 via Simon Gascoin.